When you order butterflies for a butterfly release event, you will need to know how to care for them until the day of your special event to ensure that they are alive and well, and healthy enough to live in the wild after you have released them. 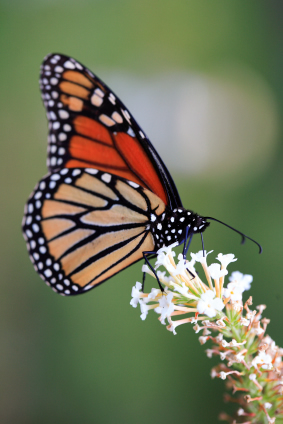 Your butterflies should arrive in either single release boxes or in a large glassine envelope. Either way, these will be packaged in a larger box that is cooled with ice packs. This is to keep the butterflies in a calm state, as they are when they hibernate during the colder months of the year. They will be alive and some may be awake and moving around so you might hear them scratching or fluttering on the inside of the box, and this is perfectly normal. Remove the ice packs from the box and re-freeze them. When they are frozen, replace the ice packs into the box and close it. You will then want to store the box of butterflies in a dark place that is not hot or stuffy, like in a closet or a cupboard, until the event day. On the day of your event, you will move the butterflies to the event in the same box that they have been stored in. Be sure to keep the box in a shaded area and don’t keep them in a hot car for more than a couple of minutes as the kind of heat that occurs in a closed up car will surely shock and possibly kill your butterflies. Two or three hours before the time of the release you will need to remove the individual release boxes or envelopes from the storage box and away from the ice in order for them to begin to warm up and get ready to fly. Place the release boxes or envelopes in a sunny spot for about a half an hour if it is a cooler day. Remember that the butterflies won’t fly at all if the temperature outside is below 55 degrees. If it is very warm outside, place the release boxes in a shady area for the two or three hours. This is all of the care that is required for release butterflies that are purchased from a reputable breeder who breeds butterflies for the purpose of release events. When it is time to release your butterflies, simply open the release box or the glassine envelope and watch them go. You can also make or purchase a special release basket that is made to make your butterfly release look even more beautiful. Release baskets can be made with a specially lined basket covered in tulle, or can usually be purchased from the same place that you purchase your live release butterflies from.